August is national sandwich month, which means there's a lot to chew on in the coming weeks. Though sandwiches have been around since the first century, their modern popularity is credited to John Montagu, the Fourth Earl of Sandwich in England. One story says that Montagu, a frequent gambler in the 18th century, refused to leave his game for a meal and instructed a servant to bring him meat tucked between two pieces of bread. Another account says that he ate it while working at his desk. Whichever the case, the idea caught on, and people began ordering "the same as Sandwich." Today, there are countless variations on the Earl's initial concept of meat and bread, and no shortage of them are available in Estacada. 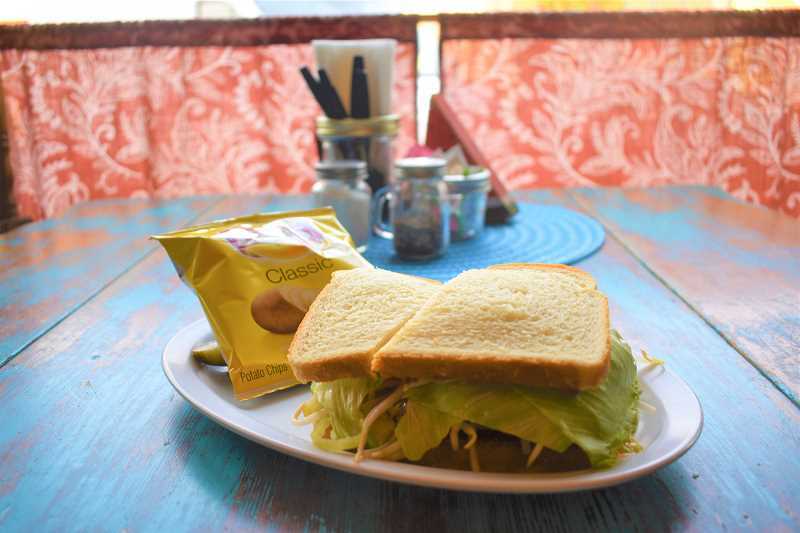 At The Cazadero, sandwiches and burgers are the highest selling category of food, and the restaurant recently introduced a food challenge featuring a sandwich with 21 ounces of meat. The Cazadero's most popular offering is the prime rib dip, which has eight ounces of shaved prime rib, swiss cheese, grilled onions and mushrooms with an au jus sauce. In second place is the BLCTA. As the name hints, it includes bacon, lettuce, cheese, tomato and avocado and is served on a hoagie roll. 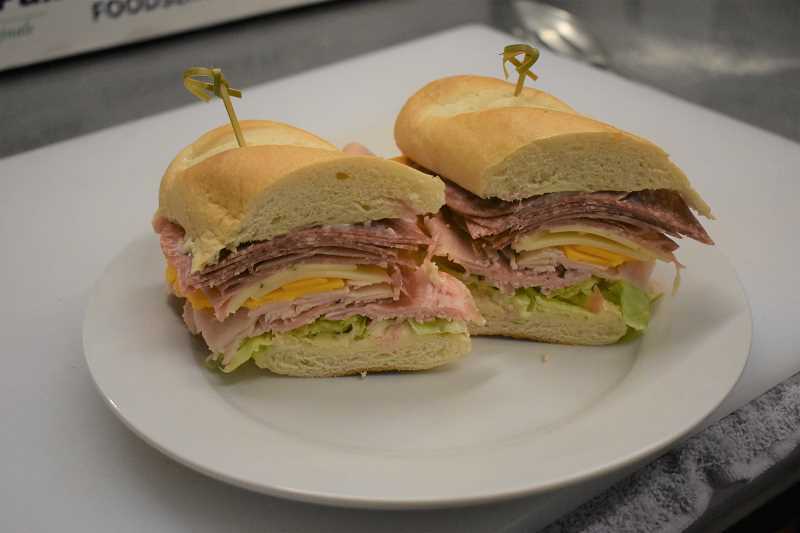 The most labor intensive sandwich is the Matty Bomb, named after chef Matty Flink. It has 2 ounces of ham, 2 ounces of turkey, 2 ounces of prosciutto, eight slices of salami, pepper jack cheese, swiss cheese, lettuce and tomatoes on a hoagie roll. Each morning, the meats for the Matty Bomb are proportioned beforehand to ensure that customers receive their food quickly. The recently-launched sandwich challenge at The Cazadero includes 7 ounces of ham, 7 ounces of turkey and 7 ounces of bacon. Named the Royal Mickey after owner Sherry Andrus' late grandmother, it also includes lettuce, tomatoes and onions and is served between two hoagie rolls. "It was a struggle to find bread that would fit the sandwich," Sherry said. The finished product is served with a pound of french fries. To win the challenge, participants must eat the entire meal within a half hour. "It'll be exciting to see how many people do it," said owner Cam Andrus. "We hope to build an energy about doing the food challenge," Sherry added. She said her favorite sandwiches at the restaurant are the Matty Bomb and the prime rib dip. "It's a tie," she said. "They're both the bomb." At The Mason Jar, DeDe Brittle appreciates the versatility that sandwiches offer her customers. "We listen to what customers have to say," she said, noting that many of the restaurant's options can be made to be veg-etarian and vegan friendly. Last month, 360 specialty sandwiches were sold at The Mason Jar. The most popular one is the reuben — corned beef, sauerkraut, swiss cheese and Mason Sauce, which is a blend of Thousand Island dressing and horseradish. The ingredients are then grilled on rye bread. "It's really pretty and golden," said Erin Brittle, a cook at The Mason Jar. DeDe added that many people compliment the sauerkraut. "We string the sauerkraut just enough. It's not dripping, but it still gets moist," she said. 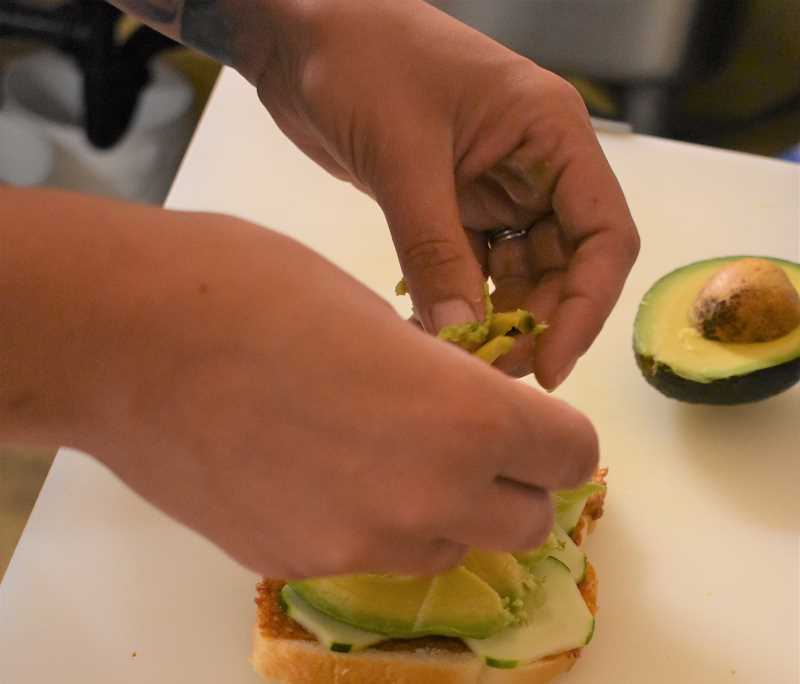 The most complicated one to make is the cucumber sandwich, which includes cucumbers, sprouts, tomatoes, lettuce, pepperoncinis, avocado, balsamic or raspberry vinaigrette and hummus or pesto spread. When all the ingredients are in place, the sandwich is 5 inches tall. "I always give people a fork, because it turns into a salad," Erin said. Another specialty sandwich at The Mason Jar is the toasted peanut butter and bacon. "It's not very popular overall but the people who eat it really enjoy it," DeDe noted. DeDe's favorite sandwich is the ultimate grilled cheese, which consists of swiss cheese, cheddar cheese, tomatoes, bacon and avocado. Erin enjoys the club sandwich because of the bacon. Along with specialty items, The Mason Jar also allows customers to build their own deli sandwiches. Within this category, the most popular offering is turkey. DeDe noted that the process of crafting a sandwich is important. "We build all sandwiches with love," she said. "We take pride in all of our sandwiches. 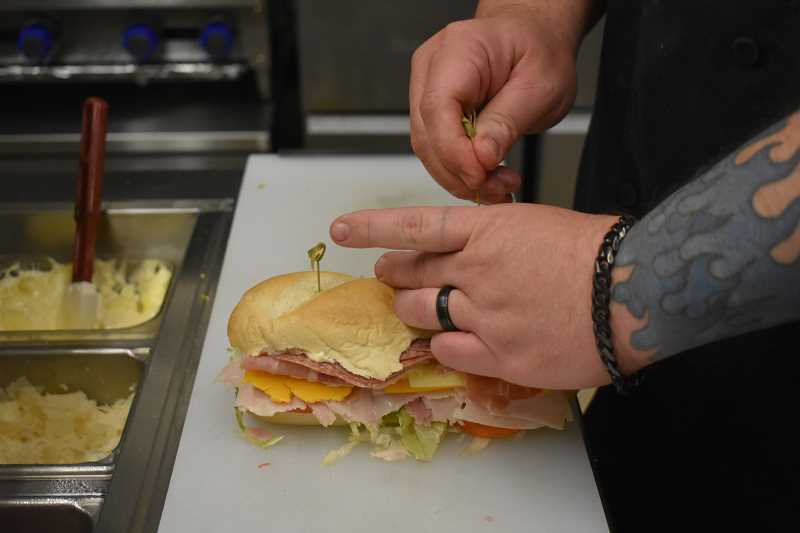 We train all of our employees, so everyone builds the sandwiches the same way. They'll taste the same no matter who makes it." She added that there's a specific order to follow when creating a tasty sandwich. "When you're building a sandwich, for example a BLT, you want the tomato in the middle and the lettuce toward the outside. You want the meat close to the bread," DeDe said. "It creates a flavor. If it's not in the right place, you're not getting the oomph that does in the sandwich." Community members have many opinions on sandwiches. Am Griswold, an artist at The Spiral Gallery, said her favorites are grilled cheese with mayonnaise and pickles, and BLTs. Her fellow artist Jami Berry said that she enjoys "a good sub, with honey mustard and vinegar." "It always tastes better if someone else makes it," Berry added, noting that Subway is her favorite spot in town to get a sandwich. Griswold's restaurant of choice is Harmony Bakery, where she likes the fried egg sandwich. "It's really good," she said. "I usually have them do the egg over easy, and there's lettuce, tomatoes and the works. It makes my mouth water." 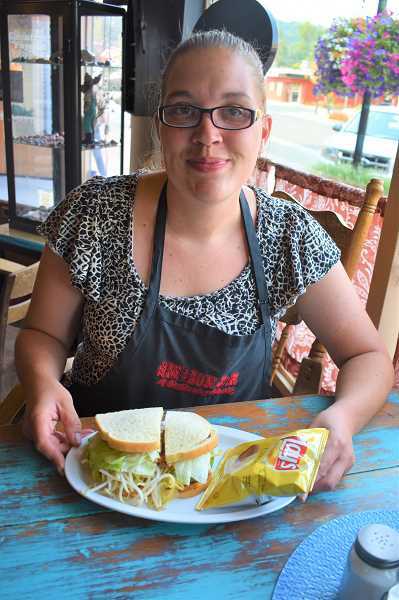 Estacada resident Laurel Tenbush enjoys a tasty BLT from any local establishment. "There are so many good restaurants out here. I eat everywhere," she said. Charlie Hall, visiting the area from Kentucky, said his favorite is peanut butter and jelly on wheat bread made by his wife, Donna. "It's like a desert," he said. Dolly Cooper, a volunteer at the Book Nook, likes tuna salad with pickles and chopped onions on sourdough or Italian bread. Some cite the bread as the most important element of a sandwich. "Anything between whole wheat or multigrain bread is good," Griswold said. "The bread needs to be soft, but firm enough to support the peanut butter and jelly," Hall added. For Berry, it's what's between the bread that matters the most. "It needs to have a good amount of vegetables and meat," she said. Cooper said that the secret to a good sandwich lies in the quality of the ingredients. "It needs to be fresh bread, and the ingredients need to be well chilled, unless it's peanut butter and jelly," she said. "Those are the two most important things." And should a hamburger be considered a sandwich? "No," Erin Brittle said. "I grew up with sandwiches being peanut butter and jelly or lunch meat." "I don't know. It's on a bun. Nobody uses a bun for a sandwich," Griswold mused, before concluding, "Maybe it's kind of a sandwich."